Released in July 1988, ‘Peek-A-Boo’ was Peepshow‘s lead single, as well as one of Siouxsie and the Banshees’ most commercially successful and critically acclaimed song. The inclusion of Warren and Mercer’s ‘Jeepers Creepers’ quotation in the ‘Peek-A-Boo’ chorus is well documented. Less so is that of the popular jazz standard derived from the film Going Places (1938), featuring Louis Armstrong serenading his horse. The book Peepshow frames the record cinematically and in doing so reveals the extent of film and film music influences present in the music, as well as the whole band aesthetic. Whilst the book does not cover the single videos in much detail, the filmic influences are equally as integral to them; the ‘Peek-A-Boo’ video in particular elucidates the band’s love of film in myriad ways. Let’s first watch the video before considering some of the shots. When talking about Peepshow, Severin often referred to the influence of Das Cabinet des Dr Caligari (1920) on the record, as well as the Peepshow tour’s ‘Caligari-type stage presentation’. Robert Weine’s benchmark Weimar classic is an example of ‘studio constructivism’: scenes built and filmed within a studio environment as opposed to on location. So iconic and influential is this particular film on wider popular culture that the French term Caligarisme has come to define artworks featuring clear ‘Caligari’ aesthetics: topsy-turvy landscapes; twisted, surrealist and/or non-linear narratives; abstract forms and shadow play. On many levels, Peepshow may be read as an example of Caligarisme and this is clearly embedded in the ‘Peek-A-Boo’ video. 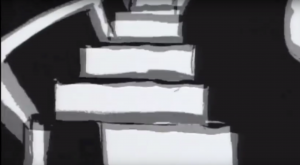 Between 21–24 seconds, the video shows a black and white, cartoon-esque animated abstract of a figure climbing stairs to a door. 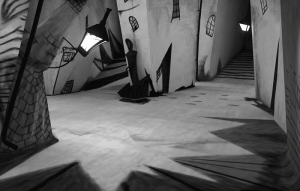 Here, the lyrical homage to Das Cabinet des Dr Caligari – ‘creeping up the backstairs’ – is visually reinforced. Above: The set of Das Cabinet des Dr Caligari (1920). Above: ‘Creeping up the backstairs’ – the staircase clip in ‘Peek-A-Boo’ is a homage to Robert Weine’s Das Cabinet des Dr Caligari (1920). Weine’s film left a lasting imprint on Severin’s psyche. After Siouxsie and the Banshees disbanded, Severin turned his attention to film composition and in 2009 launched four film ‘treatments’ entitled The Cesare Variations under the moniker ‘The Trials of Dr. Caligari’ at the Edinburgh Fringe Festival. Here is one of them; a pop art mash-up complete with melodic score entitled ‘Cesare Wakes’.